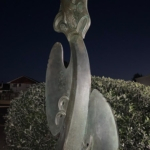 A stunning pou kaitiaki, specifically commissioned to mark the 40th anniversary of the Wakatū Incorporation, has been unveiled at an emotional dawn service. 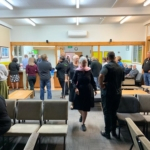 The pou recognises the significance of Nayland College in hosting the first AGM for Wakatū Incorporation on 28 October 1978. Designed and created by renowned artist Rangi Kipa, a descendant of the original tūpuna of Wakatū, the pou represents a modern interpretation of the classical kaitiaki (guardian) forms, known as manaia. 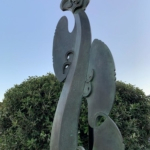 The pou kaitaki was unveiled by the talented and widely respected artist, Aunty Puhanga Tupaea, who led the design and creation of the tukutuku panels in the wharenui, Kakati, at Whakatū Marae. 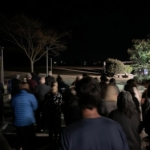 A large crowd gathered for the ceremony at dawn on Monday 4 February. 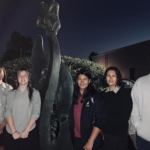 Principal Daniel Wilson explained that the pou symbolises the special relationship between the Wakatū Incorporation and Nayland College and that it will be incorporated into the local curriculum to emphasise significant stories and history of the manu whenua. The pou is located at the rear of the gym next to the new Kuaka Cafe and overlooks the mountains that hold special significance to local Maori. We encourage our community to visit and view this stunning monument.